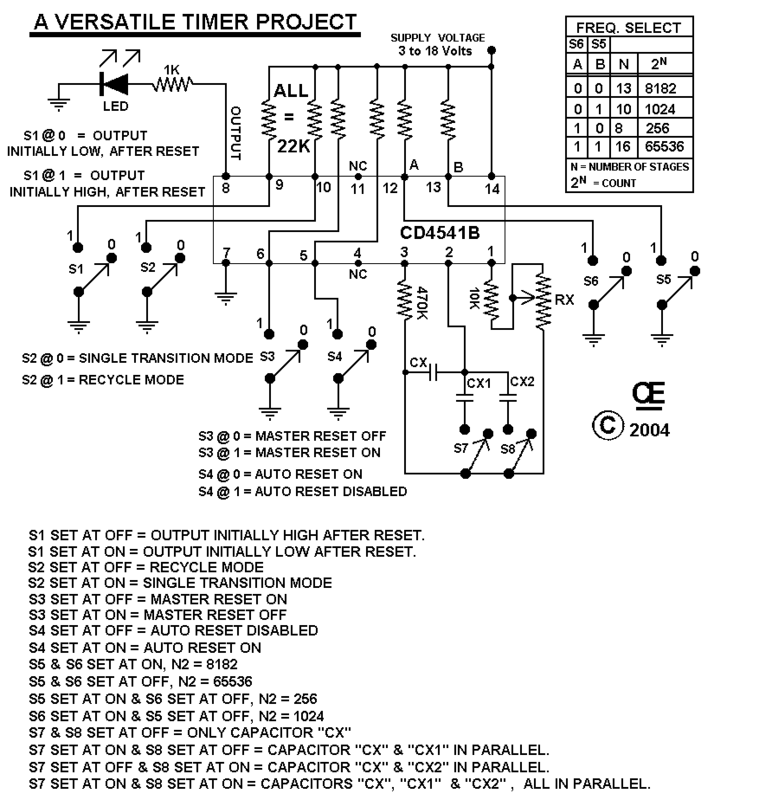 Below are Various Circuits using a CD4541B IC. The CD4151B is available from Numerous Manufacturers. The "CD" Prefex is now a "TI" Part Number. 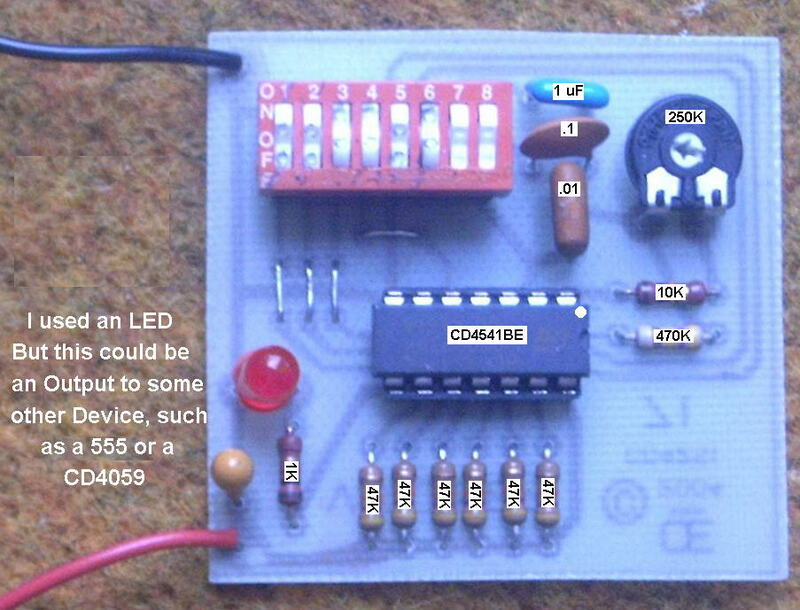 ** I am still designing up these circuit and will post them as soon as I complete each one. "CX" and "RX" determine the Frequency of Oscillation in all these circuits. Points "A" and "B" are set either Low or High to create Different "Stages" and "Counts". This along with the selected Frequency can create Very Short to Very Long Delays. Eg: A 0.22uF Cap and a 12K Resistor = 6.072. Eg: A 0.22uF Cap and a 220K Resistor = 111.32. 60.8 times 60.8 or 3,696.6 Minutes, which is 61.61 Hours. Or Other ways to Greatly Increase the Set Times. 1) Use a CD4017 "Decade Counter" to give you anywhere from 1 to 10 times this Time. 2) Use a CD4018, "Divide by N Counter". Divisions up to 10. Allows for Any Division between 3 and 21,327.
or about 900.5 days, or about 2 1/2 years. As well as making my cicuits below, you may want to get the Data Sheets at "ti.com"
and Experiment for yourself. Like the 555, This is a Very Useful Chip. 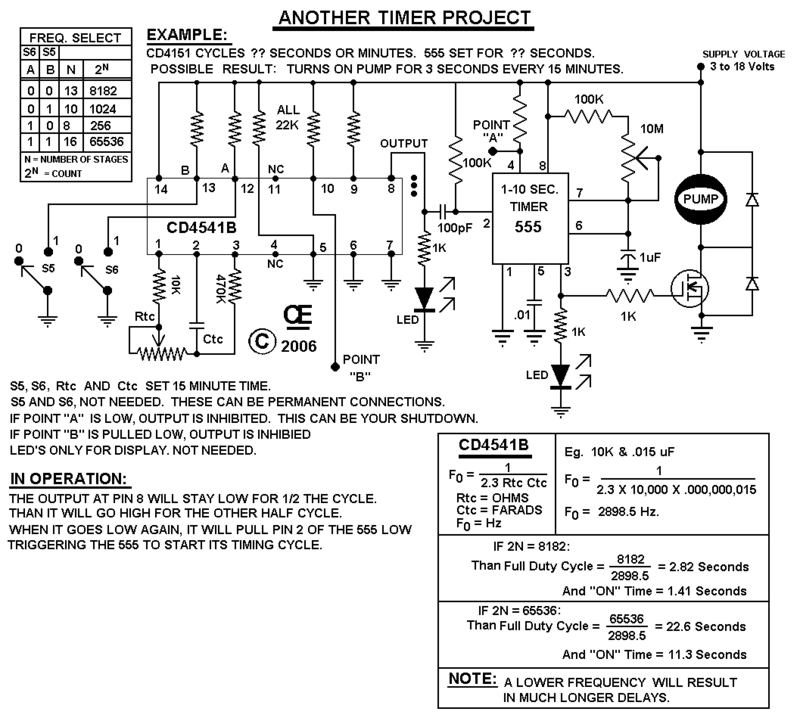 Useful Examples of this circuit: Flashing a Camera for sequential time shots. Or turning on a Sprinkler every 24 hours. Here is a basic circuit using a dip switch to control all the variables of this IC. Optionally, instead of using the switch, you can take off wires to additional logic circuits. 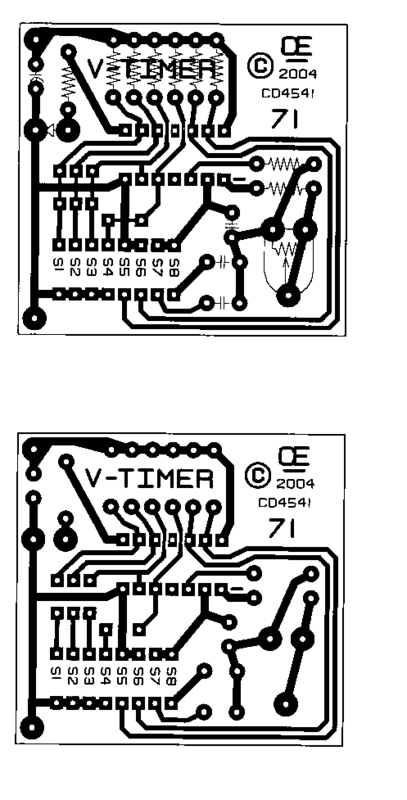 PCB for 50% Timer Above. Picture for 50% Timer Above. Another Timer using the 4541 and a 555 to run a water pump at various cycles. Added Mar 7 2006, This was a Request from one person. There are Far Too Many Possibilities to list them all here.